You may know that I am a shoe lover and as it's getting colder I have been wearing my boots a lot more to keep my feet lovely and warm. I currently only have 4 pairs of boots as I'm quite fussy and it takes me ages to find some I like. I think this pair was from Shoe Zone, I've had them for a few years and have worn them loads. These are the most expensive pair of shoes/boots I own. They were about £200 from Irregular Choice and I love them. They make your feet look so cute and small. I've had these for years and years, they are so comfy to wear and I love the lace up style. Can't remember where I got them from though and the label inside has actually worn away. These are the most recent pair of boots I've bought from Very, again with the lace up front. These are super warm as they have fur inside. I love these, you can wear the fur rolled up or rolled down. So there's my collection of boots. Have you been getting your boots out for the cold weather? I had a lovely surprise from my cat this morning, she had left a dead rat outside the back door, so gross!! She's a really good huntress but it would be nice if she didn't bring them home. The sun is shining today but it is getting colder and I'm starting to wear warmer clothes and darker colours. Today I thought I'd show you this green make up that I wear a lot which I think is a perfect colour for Autumn. Here's the face chart I completed for this look. I recently bought these from Prochart so I could design my make up looks using the actual make up products. I haven't done any make up posts for a while so here's one on how I applied the Avon Eyeshadow Quad Glow Teal. Sometimes I only use a couple of the eyeshadows from a quad palette but this time I used all 4. Avon have recently re-designed the style of their eyeshadow palettes and I quite like how they look now. This is the first time I've actually used this quad. I applied shadow 1 (lightest) as a highlighter to the brow bone. Shadow 2 (brown) I applied to my lid from the inner corner to about half way across. Shadow 3 (blue) I applied to my lid aswell but starting from half way across and to the outer corner of the eye. 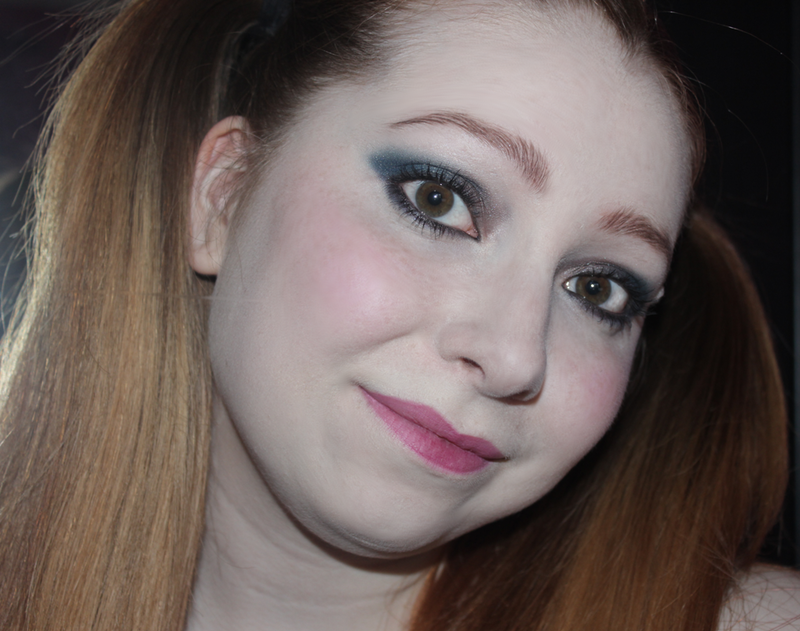 Then I applied shadow 4 (dark blue) to the crease and also lined around my eye a bit. Lastly I applied some black eye liner and mascara. It took me ages to try to photograph a close up of my eye that looked decent. I think it shows the colours quite well. As yesterday was bonfire night and lots of fireworks were going off (my cat didn't like them at all) I decided to paint some fireworks on my nails this week. I chose 5 different glitter colours as fireworks are quite sparkly.